When I write, I think of it as a selfish act, because I feel like only I derive pleasure from it. I feel like nobody will ever feel the pain pulsing out, rupturing, stinging the atmosphere, cutting through. Slicing them open, so they can feel my pain. I wonder if that happens to others, when they read what I write. For those of you in the ultra chassidish circles, you may understand this very quickly. Those of you who don’t understand, I hope to offer come clarity. Girls usually are the second or third year on the job when they get engaged. They marry a boy who was flown home from Yeshiva specifically to get engaged. He then flies back to finish his zman (Talmudic Semester). The chasunah (wedding) is scheduled so that he doesn’t break a zman, usually Yomim Tovim time (Holidays: Shavuos, Rosh Chodesh Nissan, After Sukkos, etc.). Then the fun begins. They have learn each others names… and the next thing you know, she is throwing up in the morning as she rushes to go to her measly teaching job for $300 a week… he arrives to kollel (Rabbinical College) at 11:00. He compares the lunch that his new wife packed for him, with his ‘learning’ partners. He realizes that although she made fresh brownies for him, his friend has cantaloupe. It’s now her fault that his suit is now plotzing (exploding). At night, she moves the buttons over half an inch. He breathes easier. He is turned on by watching his ‘wife’ do mommy things, stuff his mother did when he was growing up. She continues to throw up. He now learns that when she sends him an urgent text, it means that she needs to go to the doctor. He comes running. She gives birth. She is pressured to get clean quickly, she was taught that withholding him for any extra hour is wrong and not her wifely duty. She takes vitamins… anything, to get clean (see laws of family purity). Finally, nearly not making it, she goes to the mikvah at 5.5 weeks. She is throwing up again. He gets turned on by watching her nurse the baby, because that’s what his mommy used to do. He gets mad that she is losing her milk and not able to nurse the baby efficiently. He is mad that she is supplementing with formula. Go to the lactation consultant, here’s $300. Go take vitamins, drink beer. Do something! She feels miserable. Then she finds out that she never really got her period since the baby was born… and suddenly she throws up. Bam. Positive. He starts working there. Learns stuff about life. He begins to resent that she is working. He now feels manly. His self esteem has grown. He learns about which movie is good to watch. She is plotzing. He starts renting 24, CSI… all the shooting gory stuff. She is appalled. She stays silent. Finally, when he stays overnight in Monticello with his friend Yitzchok on ‘business’ on some bungalow colony they might invest in for next summer… she calls the Rav (Rabbi) who gave him his chosson (groom) lessons before the chassunah. She tells the Rav that until this marriage is stabilized, she needs a heter (Rabbinical okay) for birth control. The Rav has a screaming fit, and yells at her for even thinking so dirty. It takes ten more years and 3 or 6 children later until the relationship turns into a ‘if I don’t do his laundry and he doesn’t eat my food so that he doesn’t have to comment, I think I can survive another hour’. There is no longer any communication, no intimacy… and nobody knows! But the children get older, and they are now pre-teen. This one is failing yeshiva. That one is beating her classmates…. It’s misery. She does all the phone calls with the Rebbeim, teachers. He is now working 18 hours a day. Finally, he gets a call from the Menahal (principal) at the Yeshiva – did you know your son is now doing much better with the tutor that your wife hired last year? HUH? WHAT? He gets mad that a “man’ was hired to do totty work, and he had no idea. They start fighting… it never ends. Every rav gets involved. Nobody can make peace anymore because of all this underlying tension. It’s a mess. This is not the straw that broke the camel’s back. There never was a camel. There is no foundation in a marriage like this. So when you add any tiny pressure, there is zero communication, no skills. It’s a dead end. There is nothing to build from. The Chassidish boys are immature, not educated with any secular subjects, and have no self worth outside of Kollel. The girls are over skilled, overeducated. They become “mommy’ too quickly… and nobody knows anything about relationships, chemistry, intimacy, fostering communication. They turn to movies and get the wrong idea about romance. For all of you out there sadly nodding your heads, my heart goes out to you. My suggestion to you – build your man. Make him a human being who has discovered a healthy outlet for the things he likes in life. If he loves nature, keep sending him for those hikes. Alone, if that’s how he likes it. I know a friend whose husband is obsessed with spreading nissim related to his donations to Kupat Hair… in his spare time, he loves going around collecting their pushkas. She lets him. Gosh, if it makes the guy happy, and if helps him feel like a man? Please, by all means. Let them become a happy person. And they will shine, and rise above it all. And exceed beyond your wildest imagination. I highly, and I mean highly, recommend the book, “The Five Love Languages”. Better yet, I have the 30 minute DVD and whoever watched it says, it saved their marriage. You ask, why couldn’t I save my marriage? Unfortunately, mental illness cannot be incorporated into a marriage without treatment. Sad. So now, with divorce – this is the saga. The men, who were told their entire lives – get married, have babies, do us proud… that is all they know, and that is all the aspire to. If their wife is not happy, they think that she is leaving him because SHE is not happy. They have no idea what role they played in the decline of this relationship. So it’s all her fault. Now, they must save face in their shul. So they do one of two things. They spread stories that either she had a mental breakdown, or PPD, or BPD, or Depression… or, they tell people that she was sleeping around. I cannot tell you how many women have reached out to me, women who went through this cycle. The only thing we can do is NOT FIGHT BACK. You cannot fight this system, because the men will then find how to make you even more miserable. They will use the kids as the ultimate pawns in this war. Walk away, and they will find no reason to use the kids against you. Horrible, but true. If you want your kids to live in peace, somewhat, walk away! For those of you who haven’t been through this, may you never have to make that decision. I value your feedback. Please post your comments below. To be notified of new posts to this blog, enter your email address on the right-hand corner of this page. “Tatte Layben, I… Ma! If Zeidy is here by the seder, then I think I should say Zeide Layben”. Mah Nishatana Halayla Hazeh… Why is this night different from all other nights? On all the other nights I can eat my rice cake that I eat every night, this time. But tonight, and on this night only… (Ma! We eat matzah the entire Pesach, why do I have to say on this night only?! )…more than any other night, why do we have to eat potato? You know it’s soft and mushy and I hate the way it feels in my mouth? And then when I do swallow it, I can’t drink again until after the next Kos, after saying mah nishtanah? Why is this night different from all other nights? On all the other nights I keep my salad dry without dressing because I hate dressing and nobody forces me anymore. But tonight, and on this night only, and also tomorrow night at the second seder because we are in galus and in chutz l’aretz, not like the people who in Eretz Yisroel have only one seder each year. In America, we have two, and also if an American goes to Israel for Yom Tov, they must have two sedarim. That’s why I don’t want to go to Israel on Yom Tov because it would make me feel all mixed up inside and my brain would feel all funny and I would see everything in jumping zig-zags and I would get very upset and I would have to make that noise with my mouth because it feels better afterwards. I would much rather have two seders over here, as long as I can stay in the kitchen. And, also, if I can have my romaine lettuce dry, without being forced to dip it in the charoses, which is very old apples and are already brown, and brown is my worst color. Why is this night different from all other nights? On all the other nights I can sit on my special chair by the wall in the kitchen, where nobody can touch me or breathe near my plate, but tonight, and also tomorrow night, we have to eat reclined, and that means I would be touching Ari’s chair. If I touch Ari’s chair, I will touch Ari’s right leg and I know he will kick me. Last year in Bubby’s house he kicked me after the third kos, and when I was third grade, I was leaning on cousin Chaim from Lakewood who was 14 then, and he almost kicked me but I hated touching him because I was worried that I would get too close to his beard. His beard looked like it would be prickly and it would make me feel like I need to run to my room and bang my head for a long long long time. And then my therapist will get upset that I didn’t do the brushing exercise. Please do not reprint or photocopy without permission. In September 2006, Hatzlacha grocery store in Monsey, NY was caught selling nonkosher (treifa) chicken as from Kiryas Yoel, horrifying the Orthodox Jewish communities worldwide. The chaos that erupted created many factions and extreme responses. To lighten the devastation with some humor, I wrote the following article under an alias, which was published in the Community Connections, Monsey’s largest weekly. Our Rosh Hashanah preparations are overridden with a Pre-Pesach emotion. Few are spared, nearly everyone is caught up with the wait-and-see. Intensifying each and every p’sak, informing us on everybody’s views. Toiveling & Kashering, running at large through the Monsey/S.V. streets. Followed by the Microwaves, ovens and cutlery, all unloaded from the minivans. 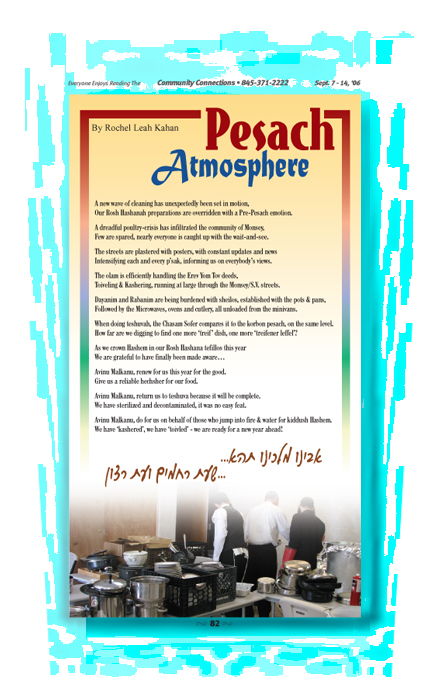 When doing teshuvah, the Chasam Sofer compares it to the korbon pesach, on the same level. How far are we digging to find one more ‘treif’ dish, one more ‘treifener leffel’? Avinu Malkanu, renew for us this year for the good. Give us a reliable hechsher for our food. Avinu Malkanu, return us to teshuva because it will be complete. We have sterilized and decontaminated, it was no easy feat. Avinu Malkanu, do for us on behalf of those who jump into fire & water for kiddush Hashem. We have ‘kashered’, we have ‘toivled’ – we are ready for a new year ahead! 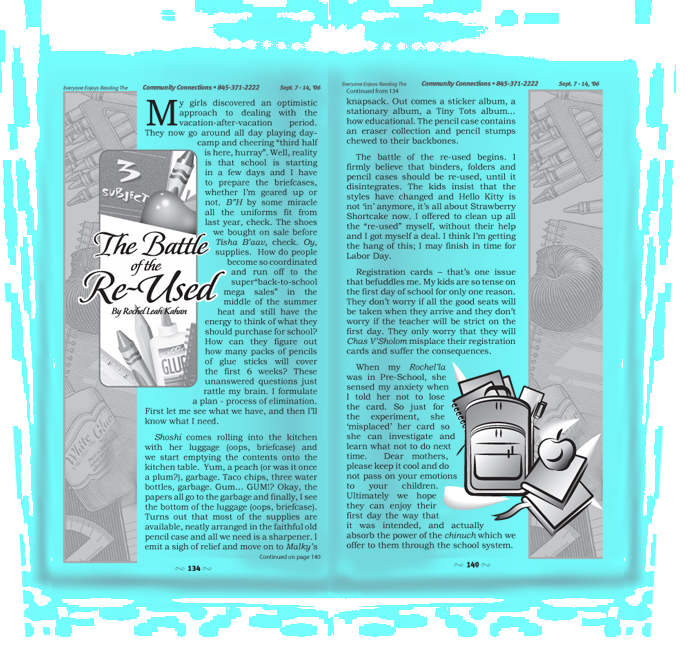 For the first week of the school year, I wrote the following article under an alias, which was published in the Community Connections, Monsey’s largest weekly. My girls discovered an optimistic approach to dealing with the vacation-after-vacation period. They now go around all day playing day-camp and cheering “third half is here, hurray”. Well, reality is that school is starting in a few days and I have to prepare the briefcases, whether I’m geared up or not. B”H by some miracle all the uniforms fit from last year, check. The shoes we bought on sale before Tisha B’aav, check. Oy, supplies. How do people become so coordinated and run off to the super “back-to-school mega sales” in the middle of the summer heat and still have the energy to think of what they should purchase for school? How can they figure out how many packs of pencils or glue sticks will cover the first 6 weeks? These unanswered questions just rattle my brain. I formulate a plan – process of elimination. First, let me see what we have, and then I’ll know what I need. Shoshi comes rolling into the kitchen with her luggage (oops, briefcase) and we start emptying the contents onto the kitchen table. Yum, a peach (or was it once a plum? ), garbage. Taco chips, three water bottles, garbage. Gum… GUM!? Okay, the papers all go to the garbage and finally, I see the bottom of the luggage (oops, briefcase). Turns out that most of the supplies are available, neatly arranged in the faithful old pencil case and all we need is a sharpener. I emit a sigh of relief and move on to Malky’s knapsack. Out comes a sticker album, a stationary album, a Tiny Tots album… how educational. The pencil case contains an eraser collection and pencil stumps chewed to their backbones. The battle of the re-used begins. I firmly believe that binders, folders and pencil cases should be re-used, until it disintegrates. The kids insist that the styles have changed and Hello Kitty is not ‘in’ anymore, it’s all about Strawberry Shortcake now. I offered to clean up all the “re-used” myself, without their help and I got myself a deal. I think I’m getting the hang of this; I may finish in time for Labor Day. Registration cards – that’s one issue that befuddles me. My kids are so tense on the first day of school for only one reason. They don’t worry if all the good seats will be taken when they arrive and they don’t worry if the teacher will be strict on the first day. They only worry that they will Chas V’Sholom misplace their registration cards and suffer the consequences. When my Rochel’la was in Pre-School, she sensed my anxiety when I told her not to lose the card. So just for the experiment, she ‘misplaced’ her card so she can investigate and learn what not to do next time. Dear mothers, please keep it cool and do not pass on your emotions to your children. Ultimately we hope they can enjoy their first day the way that it was intended, and actually absorb the power of the chinuch which we offer to them through the school system.